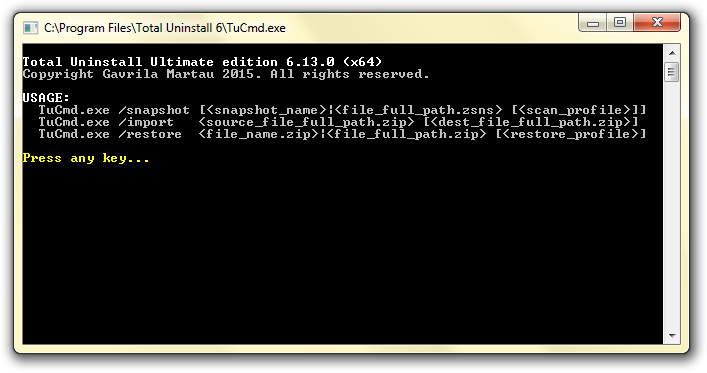 The executable program that interprets commands is TuCmd.exe. The program is part of the Ultimate edition package available only after purchase. Current version supports the bellow commands. Others can be implemented at request. /snapshot [<snapshot_name>|<file_full_path.zsns> [<scan_profile>]] Creates a system snapshot using default or specified scanning profile. The snapshot name is optional, default name is generated from current date and time. /import <source_file_full_path.zip> [<dest_file_full_path.zip>] Converts the program/bundle backup archive created on another system with Total Uninstall to be compatible with the current system. This step is required for a program transfer operation. /restore <file_name.zip>|<file_full_path.zip> [<restore_profile>] Restore a compatible program/bundle backup archive on the current system.